It’s all too easy to assume that what we imagine is an accurate reflection of reality. Many of our greatest deceptions evolve out of such faulty supposition. This eminently human quandary is delightfully expressed in the now infamous 1986 Guardian commercial ‘Points of view’. A short film shows the same scene but taken from different viewpoints. Each of the black-and-white shots lasts about six seconds, at the end of which the image fades out. The first shot shows a man starting to run; the second pans from behind the man to the right in the process of following his run and showing his deliberate and seemingly aggressive collision with an older man; the third view from a higher vantage point indicates that construction materials are falling from above. The points of view are revealed in a manner that consciously delays the moment where the actual meaning of the action – a younger man saving an older gentleman from the hazard rapidly falling into his path – becomes clear. The images are supplemented by a short voiceover saying: ‘An event, seen from one point of view, gives one impression. Seen from another point of view, it gives quite a different impression. But it’s only when you get the whole picture, you can fully understand what is going on.’ A fourth shot showing only the newspaper’s name is silent. The suggestion to the audience is that The Guardian values objectivity and, by implication, questions the subjective nature of experience and highlights the constraints this imposes on our perception, our memories and on our ability to anticipate the future. In essence, if we were able to look into the crystal ball we would be unlikely to interpret facts objectively. Our experiences are subjective. This has consequences for the way we remember the past, the way in which we view the present and the manner in which we predict the future, even down to envisioning imaginary worlds that may never come to exist except in the mind’s eye. Our perceptions and memories are not fixed, factual entities – they can shimmer and change, depending on our current point of view. These alternative realities are constrained by the fact that we don’t see all that can be seen, our memories are not an accurate repository of what happened in the past, and our thoughts of the future are often equally inaccurate and ill-conceived because of these constraints on perception and memory. ‘You don’t remember what happened. What you remember becomes what happened’, as John Green so aptly stated in his amusing 2006 novel An Abundance of Katherines. As in life, stories rely heavily on the sequence in which events unfold and this colours the way in which we interpret our perceptions and our memories, allowing them to be altered each time we revisit them. Our scientific understanding of this reconstructive nature of memory has its scientific origins in the work of Sir Frederic Barlett. In his famous 1932 book Remembering, he describes a study in which he asked participants to read and then retell a North American Indian folktale ‘The War of the Ghosts’. People distorted the story to fit in with their pre-existing knowledge structures, omitting the sections that seemed irrelevant, and changing the emphasis and structure of the story to match their own experiences of how the world works. It is now well established that our episodic memories of past events can change each time we revisit them, depending on our mood and point of view. This causes us to frequently question the authenticity of memory, pondering the validity and meaning of experience – what was real, what was imagined, what, if any of it at all, will be real tomorrow? Our thoughts and perceptions of the past and future are transformed through time. Sometimes these transformations can be so extreme that it is possible to create a false memory of something that never actually happened. The seminal studies of Elizabeth Loftus have revealed how easily memory recall can be manipulated through language, overriding the perceptual feedback of the event itself. For example, when participants were asked to view videos of a car accident with collisions at 20, 30 and 40 miles an hour respectively, and then asked to judge how fast the cars were going when the accident happened, their responses were primarily influenced not by the perceived speed at which the cars were actually going, but by the choice of words such as ‘smashed’ as opposed to ‘bumped’ that were used to phrase the question. When asked additional details about the event such as whether or not they had seen any broken glass at the scene, participants were much more likely to say yes if the word ‘smashed’ had been used to pose the question. Our memories are so malleable that they are not only reconstructed but in some cases, misconstructed. This begs the question of why episodic memories and perceptions are so labile, rather than being a fixed repository of the past. The answer lies in the fact that our memories are as much about what will happen next, as about what has already occurred. Indeed, it is thought that the episodic memory system evolved for thinking about the future rather than the past: this is the so-called prospective brain hypothesis proposed by Dan Schacter and colleagues (Schacter et al., 2007). This hypothesis posits that a crucial function of the brain is to use information gleaned from past experience to simulate a series of future scenarios and in so doing not only to juxtapose a number of alternatives, but crucially to predict and plan for those possible eventualities. No wonder ‘it’s a poor sort of memory that only works backwards’ as the White Queen so shrewdly remarked in Lewis Carroll’s poignant tale Through the Looking Glass. This flexibility in our ability to simulate multiple points of view is great for creativity. As we have argued previously, we have an internal hidden compass that we use to orient ourselves in space and time, to project ourselves into times past and future and even into other people’s lives, capturing a landscape that contains past, present and future, all of which can be accessed simultaneously. This ‘creative navigator’s compass’ comes at a cost, however, in terms of accuracy – our attention, our perception and our memories are selective and subjective, the brain anticipates what it expects to see and makes associations that are ultimately sometimes deceptive. One of the sources of such deception is our obsession with the self in the current moment – we suffer from an enduring propensity to think that the future will be much more like the present than it ever really will be. Dan Gilbert describes this temporal myopia when it comes to envisioning futures in his wonderfully entertaining 2006 book Stumbling on Happiness; for example, he convincingly demonstrates that people’s choices of what they think they will want to eat tomorrow will be heavily influenced by their current motivational state, irrespective of whether or not those states will be experienced tomorrow (see also Cheke et al., 2016). This is a familiar experience: most of us make poor dietary choices if we go grocery shopping while hungry, because of our inability to dissociate current needs from possible future ones. Such temporal myopia constrains our memories of what happened. It could be argued we don’t see and remember all that happened because we are too busy reconstructing those memories to fit into our existing schema of how the world works. In so doing we override what was actually perceived in favour of what we think we see and know, hence the illusory nature of false memories discussed earlier. Visual illusions and magic effects capitalise on these particular aspects of perception too, as does much of art, including dance (see our work on its evolution, with Kevin Laland). The errors that illusions and other visual effects induce in our perceptions are systematic, revealing fundamental features of our perception. As Dan Gilbert so eloquently states ‘they are not silly mistakes but clever mistakes, ones that allow those of us who understand them to glimpse the elegant design and inner workings of the mind’. The mistakes we make when we try to imagine our personal futures and reflect upon our treasured memories are also systematic. They too have a pattern that tells us about the powers and limitations of using our creative navigator’s compass to explore the world. We use our eyes to look into space, and our creative compass to navigate through space and time – just as our eyes sometimes lead us into seeing things as they are not, our episodic cognition can lead us to remember things falsely and foresee things as they will not be. ‘Boundary extension’ is a classic case in point here. This is the phenomenon whereby people consistently perceive and imagine a greater expanse of a scene than the one they were actually shown. Eleanor Maguire and colleagues have demonstrated that people confidently think they remember an extended scene rather than the original one. Patients with selective hippocampal damage cannot imagine complex spatially coherent scenes, and intriguingly these amnesiacs do not show the boundary extension error, presumably because they do not have access to the creative navigator’s compass. Are humans unique among the animal kingdom in having this ability to project the self through space and time, or might some other animals possess this ability? It remains to be seen whether or not non-human animals also experience boundary extension. What we do know, however, is that some animals can remember the past and that they can also plan for the future. Surprisingly some of the most convincing evidence comes from studies of corvids, members of the crow family, whose cognitive abilities have earned them the nickname ‘feathered apes’. These birds hide food for the future and have excellent memories of specific past caching episodes – of what they hid, where and how long ago (Clayton & Dickinson, 1998), and they can also plan for the future, knowing where to hide food for tomorrow’s breakfast (Raby et al., 2007). Furthermore, they can ignore their current needs at the time of caching in order to choose to cache those items they have learned they will want in the future when they come to recover and eat their caches. Given the ill-informed dietary choices we often make, that seems no small feat. But perhaps the reason the jays are able to dissociate current and future needs is precisely because they are not relying on the episodic cognition system, that subjective experience of thinking, which all too easily constrains our perception and our memories. One aspect of the remit of art is to unravel these issues and throw light onto the edges of our perception, illuminating the constraints on cognition. Although the differentiation between episodic and semantic memory was first proposed by Endel Tulving, the distinction between imagination and knowing/factual labels and its impact on cognition has long been appreciated by artists. 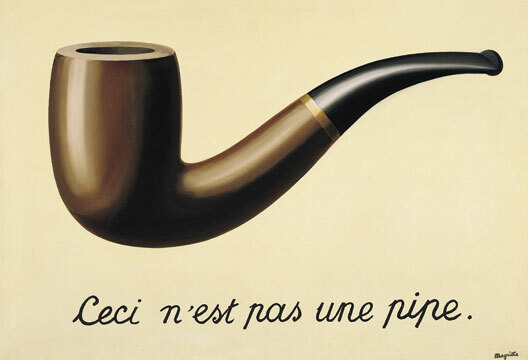 The dichotomy of what is and what might be is explored in René Magritte’s ‘Ceci n’est pas une pipe’, which requires us to question and reflect upon the deliberate contradiction between what we see, what we know and how we can alter our perception to take on board new or deliberately altered ways of seeing (Berger, 1972). Often our conjecture of such material takes place in fantasies and dreams. This may be one explanation of the surrealist’s preoccupation with depicting reality as a dreamscape that emphasises the inaccuracy and lability of memory; and a description of the way in which we reinterpret what we see and remember, to fit within our pre-existing schema. The surrealists were no doubt past masters of this emphasis on the reconstructive, rather than reproductive, process of memory recall. This notion is epitomised in the work of Giorgio de Chirico and Paul Delvaux in the period just before Sir Frederick Bartlett’s seminal book on remembering. Many artists have explored alternative realities and what they reveal about perception and memory, often by reinterpreting the work of those that have gone before and exploring the subsequent insights gained concerning personal identity as part of an ongoing need to make sense of history (see Wilkins, 2008). A fundamental feature of the human mind is our obsession with the future. Memory is no exception. The fact that memory evolved to be forward looking is reflected in our approach to creativity, wherein we allow ourselves the opportunity to mix and match aspects of the past to develop and explore new futures. Most commonly in a post-modernist world, one that has yet to find a new direction, this has resulted in a retrospective approach to innovation, which in truth may not be true creativity; and as a species we do realise this and feel the loss of a defining future. This is one of the dilemmas of the first part of the 21st century. Our propensity, in the absence of innovation, is to imagine the future will be more like the present or even the immediate past than it ever will be. Such temporal myopia and the inability to generate new thought may be the stumbling block of the time we live in. Despite our clever mechanisms for circumventing our own limitations we find it harder to see further than we would like. Artists recognise that the viewer strives to see more in an image than is actually there. Although the current scientific interest in boundary extension focuses on the perimeter of a viewed image, the mind, as artists have long known, tries to extend everything, not only space. The spectator attempts to make sense of the picture plane by interpreting not only the edges of the image but, the subject matter itself, its composition, and the potential permutations of meaning that the work may imply. The iconography of painting requires the viewer to read and interpret the image, not only to make sense of what appears in that moment, but also to conjecture what went before. This is done with reference to what we imagine happened in the past, in order that meaning of what is to come next may be anticipated, in recognition that as a species we are always more interested in the future. On analysis it often seems that magnetic north is constantly shifting in our minds eye, due to the indeterminate nature of consciousness itself and our constraints on perception and memory. Our partnership, as an experimental psychologist and ‘artist in residence’ at the University of Cambridge, allows us to converge on this issue using evidence from both science and the arts. It’s a phenomenon that is universally experienced and yet it remains, like the future, consistently elusive. - Nicky Clayton is a scientist and ornithologist. She is Professor of Comparative Cognition in the Department of Psychology at the- University of Cambridge, and Scientist-in-Residence at Rambert. - Clive Wilkins is an artist and writer, and Artist-In-Residence in the Department of Psychology at the University of Cambridge. Barlett, F. (1932). Remembering. Cambridge: Cambridge University Press. Cheke, L.C. & Clayton, N.S. (2012). Eurasian jays (Garrulus glandarius) overcome their current desires to anticipate two distinct future needs and plan for them appropriately. Biology Letters, 8, 171–175. Cheke, L.G., Simons, J.S & Clayton, N.S. (2016). Higher BMI is associated with episodic memory deficits in young adults. Quarterly Journal of Experimental Psychology, 69(11), 2305–2316. Clayton, N. S. & Dickinson, A. (1998). Episodic-like memory during cache recovery by scrub jays. Nature, 395(6699), 272–278. Correia, S.P.C., Dickinson, A. & Clayton, N.S. (2007). Western scrub-jays (Aphelocoma californica) anticipate future needs independently of their current motivational state. Current Biology, 17, 856–861. Emery, N. J. & Clayton, N.S. (2004). The mentality of crows: Convergent evolution of intelligence in corvids and apes. Science, 306, 1903–1907. Gilbert, D. (2006). Stumbling on happiness. Cambridge, MA: Knopf. Hassabis, D. & Maguire, E.A. (2007). Deconstructing episodic memory with construction. Trends in Cognitive Science, 11, 299–306. James, W. (1890). The principles of psychology. New York: Henry Holt and Co.
Laland, K., Wilkins C.A.P. & Clayton, N.S. (2015). The evolution of dance. Current Biology, 26, R5–R9. Loftus, E. (1974). Reconstruction of automobile destruction: Example of interaction between language and memory. Journal of Verbal Learning and Verbal Behavior, 13, 585–589. Loftus, E. (1975). Leading questions and eyewitness report. Cognitive Psychology, 7, 560–572. Loftus, E. (2005). Planting misinformation in the human mind: A 30-year investigation of the malleability of memory. Learning and Memory, 12, 361–366. Mullally, S.L., Intraub, H. & Maguire, E.A. (2012). Attentuated boundary extension produces paradoxical memory advantage in amnesic patients. Current Biology, 22, 261–268. Raby, C.R., Alexis, D.M., Dickinson, A. & Clayton, N.S. (2007). Planning for the future by western scrub-jays. Nature, 445, 919–921. Schacter, D.L., Addis, D.R. & Buckner, R.L. (2007). Remembering the past to imagine the future: The prospective brain. Nature Reviews Neuroscience, 8, 657–661. Tulving, E. (1972). Episodic and semantic memory. In E. Tulving & W. Donaldson (Eds.) Organisation of memory (pp.381–402). New York: Academic Press. Wilkins, C.W. (2008). Creatures in the night. Dingley: Dingley Press.